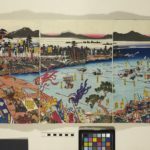 Hiroshige's Japan: Stations of the Tōkaidō Road is an exhibition toured by the Ashmolean Museum and presented at RAMM from 29 November 2016 to 16 April 2017. 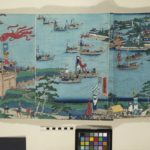 Complementing Hiroshige’s prints there is a Japanese triptych book from RAMM’s collection. 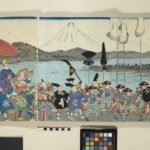 The interpretation of each scene of the triptych has been kindly provided by Dr Clare Pollard, Curator of Japanese Art at the Ashmolean Museum, University of Oxford. About 1860. Colour woodblock print. Utagawa (Gountei) Sadahide , Utagawa Yoshitora, Utagawa Kuniyoshi, Utagawa Kunitsuna, Morikawa Chikashige, Utagawa Yoshifusa and Toyohara Kunichika. 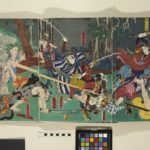 Triptych book formed by 12 ukiyo-e prints by various woodblock print designers that include scenes from the renowned tale of the 47 Ronin and other historical and battle scenes. The triptych book was donated to RAMM in 1933 by Exeter-resident Lieutenant-Colonel R.J. Saumarez (1864 -1943). The prints were cropped and inserted back to back into the book. Images of each scene are presented at the bottom of the page. 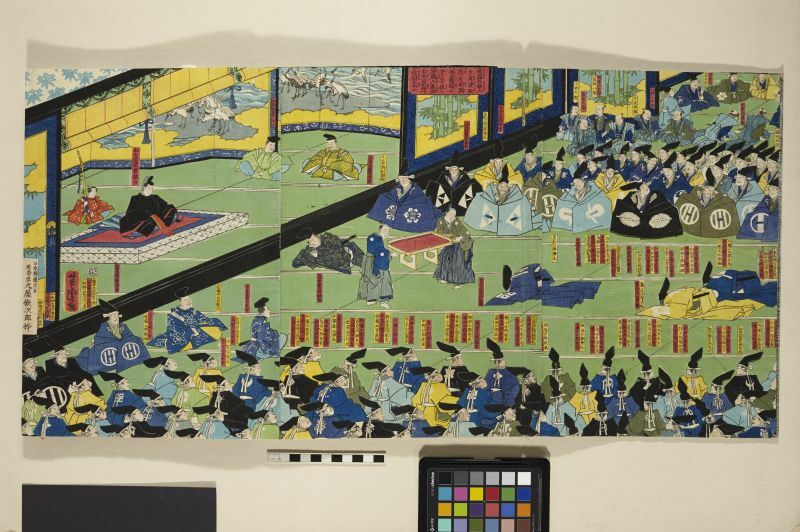 This depicts a scene at the court of the Kamakura shogunate. On the raised tatami is sitting Minamoto no Sanetomo源實朝公 (1192-1219, r. 1203-1219), the third shogun of the Kamakura Shogunate and the last head of the Minamoto clan. He was a talented poet, with one of his tanka poems being included in the anthology 100 Poems by 100 Poets (Ogura Hyakunin Isshu). He was assassinated on New Year’s Day in 1219 by his nephew Minamoto no Yoshinari, shortly after participating in a ceremony celebrating his nomination to the honorary court position of Minister of the Right (Udaijin 右大臣). 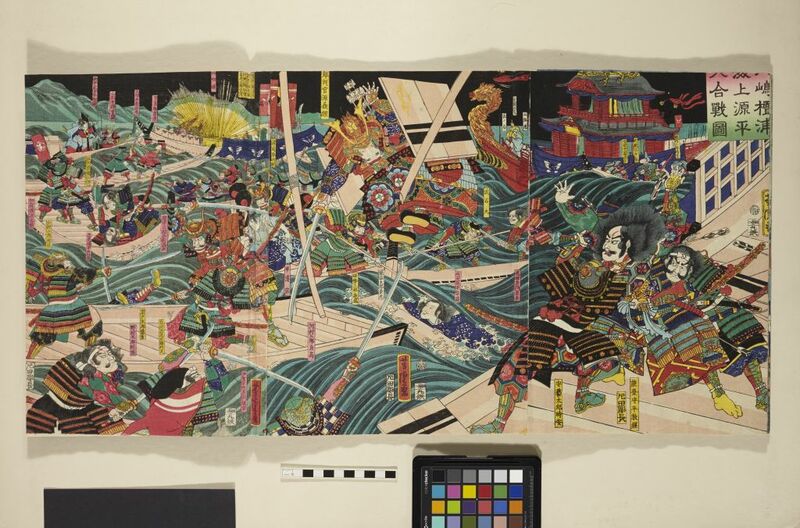 Since he is given the title ‘Udaijin Minamoto no Sanetomo’ in this print, this scene might be shortly before his death. Sadly the narrative panel at the top has been cropped so it is hard to make out what is being said. Ashikaga Yoshimitsu is known as the shogun who ended the imperial division of Japan (between the Northern and Southern Courts) in 1392. 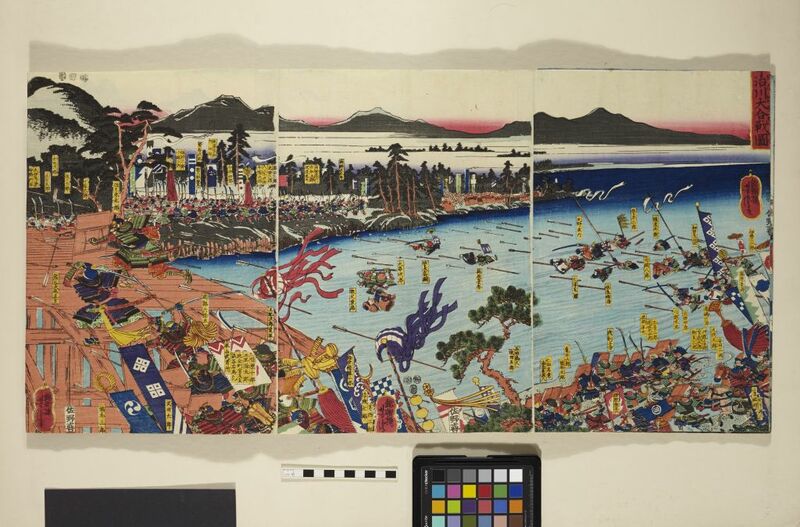 It is interesting that Yoshitora has depicted Yoshimitsu travelling eastwards with Mount Fuji in the background of this print even though Yoshimitsu was actually based further west in the Kansai area. 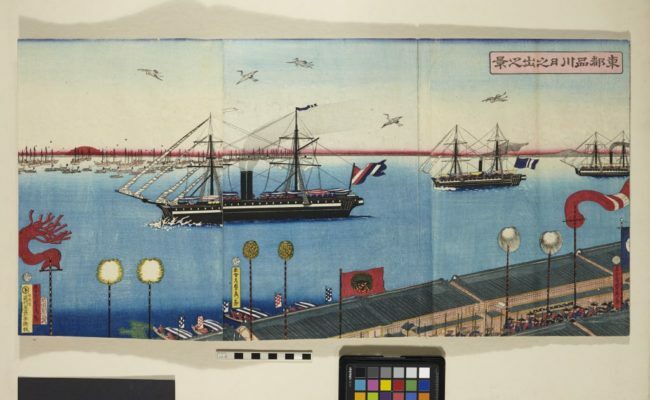 Gountei Sadahide is best known for his pictures of foreigners in Yokohama in the 1860s (known as Yokohama-e). 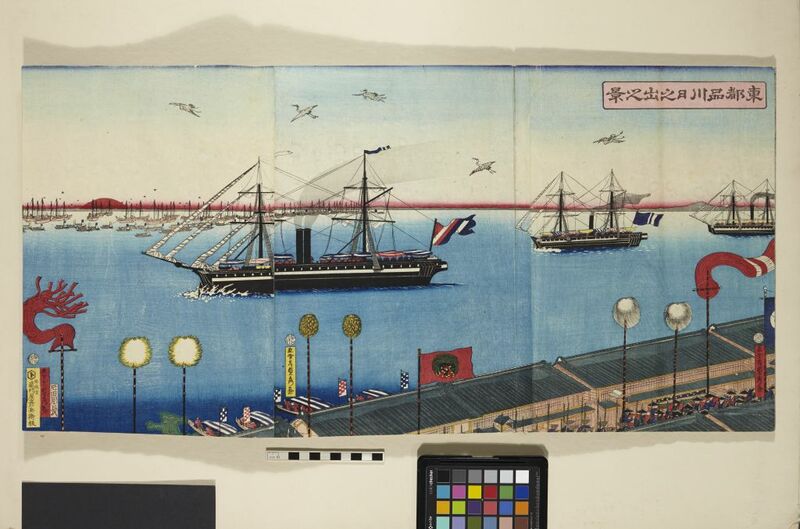 Although this looks like a typical Sadahide Yokohama-e, with the foreign ‘black ships’ in the harbour, it is actually a view of Shinagawa in Edo. 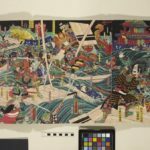 The print is surely inspired by the Hiroshige’s famous depiction of Shinagawa, Shinaga hinode, the second print in his Hoeidō ‘53 Stations of the Tokaido’ series. 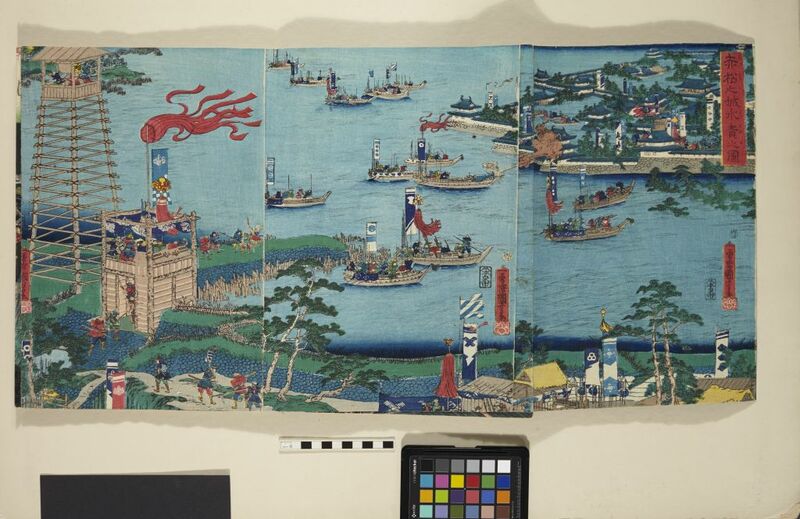 As in Hiroshige’s print you can just glimpse a daimyo procession passing along the street of shops and restaurants. The cranes flying overhead are auspicious symbols, representing longevity and good fortune. 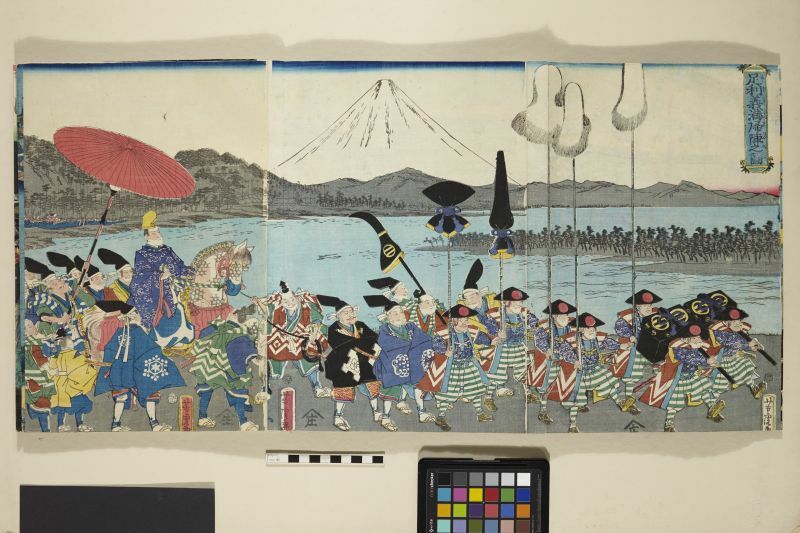 This triptych is typical of the ‘great armies’ genre that was popular with Utagawa School artists in the mid-19th century. 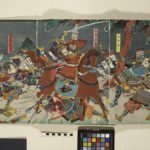 These big set piece prints revived scenes from the Japan’s medieval past, when the powerful warrior clans battled for control of the country before final unification under the Tokugawa shoguns. 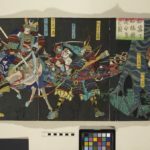 Ukiyo-e artists were officially banned from depicting actual historical events involving the shogunate, but as censorship began to be relaxed in the 1860s, print designers found a ready market for previously censored historical imagery. ‘Akamatsu Castle’ is really Takamatsu Castle, which was besieged by Toyotomi Hideyoshi in 1582. After a month or two of siege, Hideyoshi built dykes to divert a nearby river and flooded the castle, leading to a quick surrender. 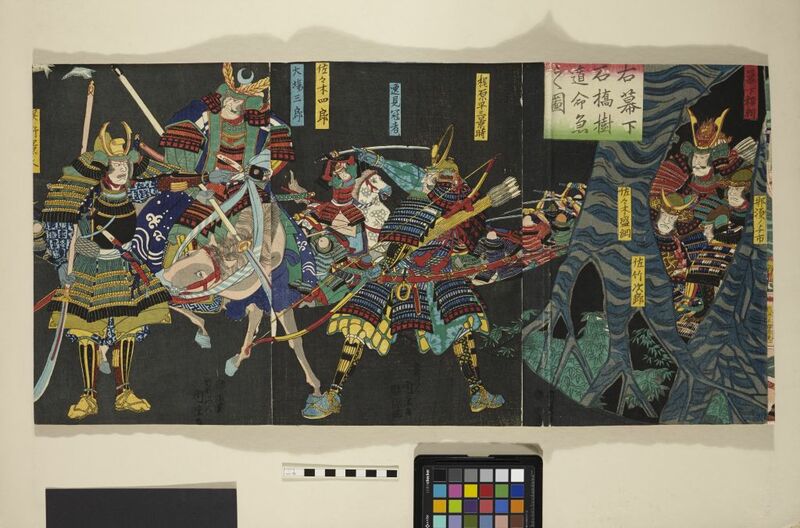 Both prints depict the second of two dramatic battles that took place in 1183 at the Uji River, during the Genpei wars (between the Minamoto and Taira clans). 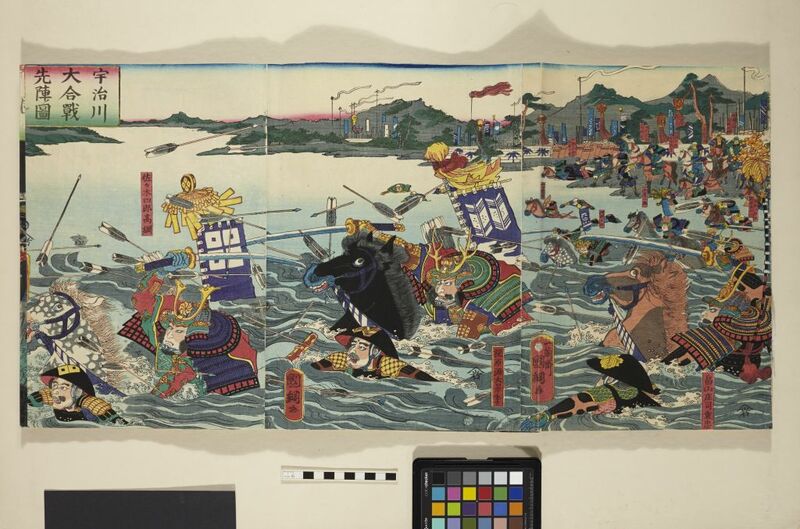 Both prints show the two Minamoto warriors Sasaki Takatsuna 佐々木高綱 and Kajiwara Kagesue 梶原景李 leading the Minamoto forces across the flooded river. 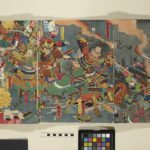 The two competed to cross first, an incident that was famously recounted in the medieval epic, The Tale of The Heike, and was a popular subject of paintings and of musha-e warrior prints. See: http://www.aisf.or.jp/~jaanus/deta/u/ujigawanokassen.htm for more detail about the Uji battles. 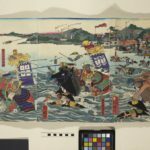 The battle of Dannoura was a major sea battle of the Genpei War, occurring at Dannoura in the Shimonoseki Strait off the southern tip of Honshu. 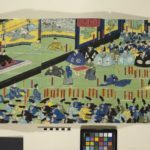 On 24 March, 1185, the Genji (Minamoto) clan fleet, led by Minamoto no Yoshitsune, defeated the Heike (Taira) clan fleet, and this battle inspired many print designs. 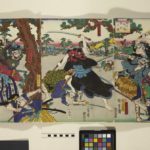 This print shows the warrior Minamoto no Yoritomo and his men hiding from their enemies in a tree during the Genpei War (1180-1185). After his defeat at the Battle of Ishibashiyama, Yoritomo was being followed through the Hakone Mountains by warriors from the enemy Taira clan. 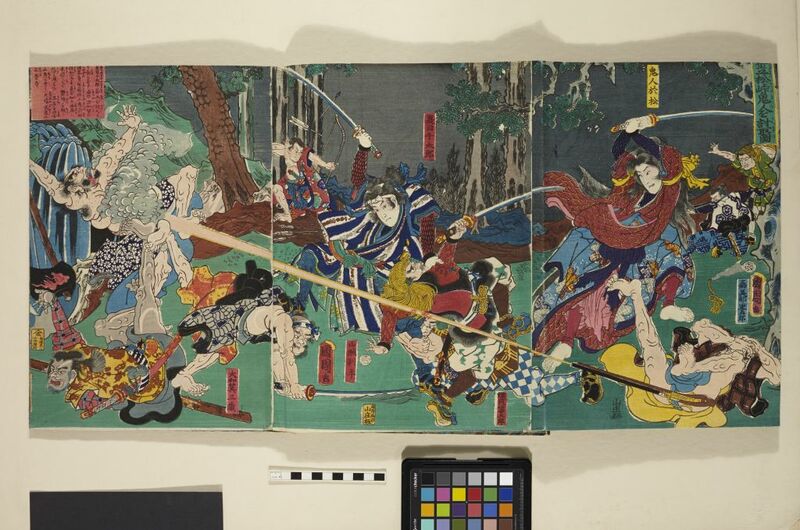 One of these warriors, Kajiwara Kagetoki (in the centre here with a bow), was secretly a supporter of Yoritomo. When the Taira soldiers came upon the tree where Yoritomo was hiding, Kagetoki stuck his bow into the tree. This startled two doves that flew away from the tree (see here top left). Kagetoki convinced the other Taira soldiers that no one could be in the tree with the doves, thus allowing Yoritomo to escape. The Minamoto side eventually won the war, and Yoritomo became the military ruler of the county. 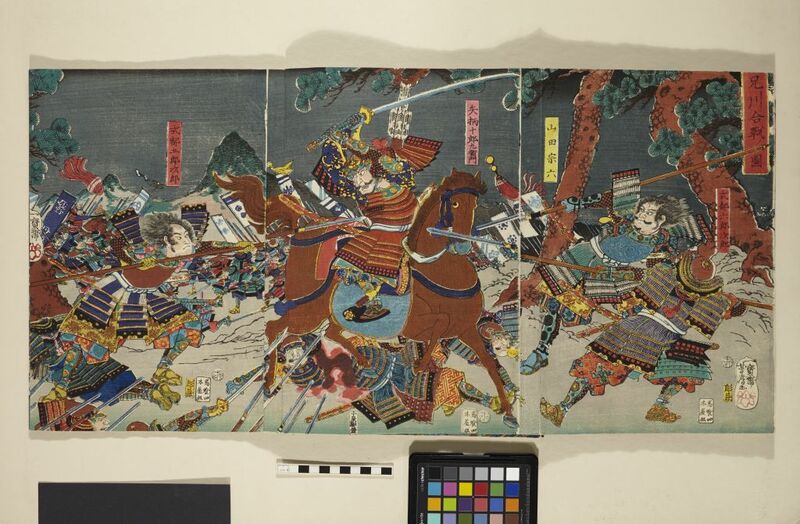 Presumably this print is making reference to the Battle of Anegawa of 1570, between the allied forces of Oda Nobunaga and Tokugawa Ieyasu and the combined forces of the Azai and Asakura clans. As it was forbidden to depict recent political events, the battle name may have been ‘disguised’ in order to avoid censorship. 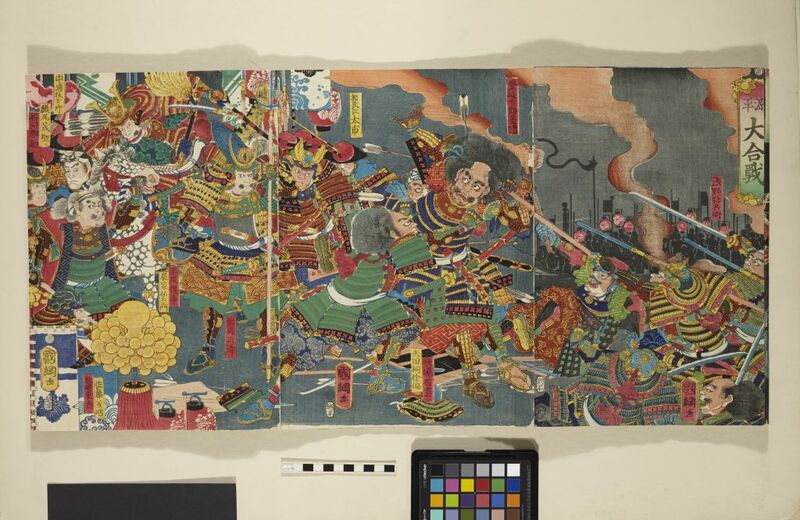 This print makes reference to the Duel of Takadanobaba of 1694, in which Horibe Yasubei (1670-1703, later to become one of the famous forty-seven rōnin, seen here in the centre), bravely defeated several warriors. 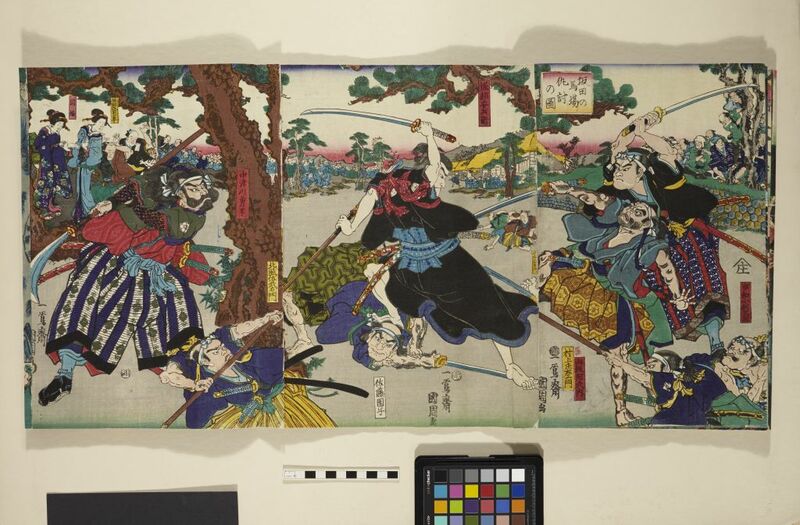 The female demon-robber Omatsu (right) being killed by Natsume Sentarō (centre) at the Kasamatsu mountain pass. The red cartouche top left explains the events depicted. The story was include in the popular kabuki play, ‘Shinpan koshi no shiranami’. 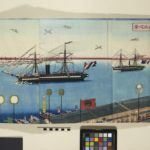 Posted in Ethnography, Research Collection by carmenmarinramm on February 1st, 2017.